Are you concerned about neighbors encroaching on your land? Or are you a realtor selling a client’s property, only to find that trespassers have been living there? You need an attorney-run title company near you to walk you through adverse possession laws. Put simply, adverse possession is a legal means of gaining the rights to a property by occupying the land without permission of the owner. 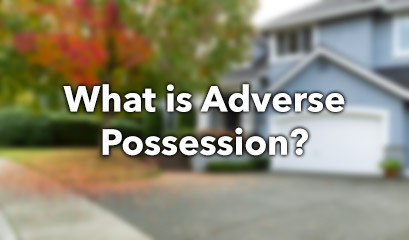 Adverse possession can occur when a trespasser moves onto an abandoned or neglected property, and maintains the property for a certain period of time. State laws vary, but after a given period, the trespasser can apply to acquire the title to the land. This can occur with “color of title” – the trespasser has some evidence that they do in fact own the property – or without it. Adverse possession applications have been on the rise in Miami-Dade and Broward counties. However, not all of these claims are valid, and many can easily be thrown out of court. Hostile Claim. This requires that the trespasser either be aware of their trespassing, simply occupy the land (with or without knowledge that it’s private property), or occupy the land honestly believing that they are the owner (by having an incorrect or forged deed, for example). Actual Possession. The trespasser must live on the property (i.e. be physically present) and treat it as their own. Open and Notorious Possession. The trespasser must be openly and obviously living on the property (i.e. not secretively hiding out there). Exclusive and Continuous Possession. The trespasser must be in continuous possession of the land for the required time frame, and has sole possession. Florida also requires that trespassers maintain, cultivate, or improve the property, and that they pay property taxes for seven years. For trespassers without color of title, the law further requires that they pay all outstanding mortgages and liens, maintain structures on the property without entering them, and only apply for adverse possession for one property at a time. The intentions of the trespasser are not relevant in court. Whether the trespasser honestly did not know that they were trespassing, or knew and purposefully tried to appropriate the land, does not affect the court case. Adverse possession can also apply to portions of land. If, for instance, your neighbor’s fence or shed encroaches on your property, they may be able to file for adverse possession after seven years. The easiest way to resolve this issue is the direct approach. First, ask your neighbor to remove their structure from your property. If they refuse, consult a real-estate lawyer, and issue them with a statement in which you “give permission” for them to use the land. This essentially removes their “hostile claim” and their “exclusive ownership”. Your permission can always be revoked at a later stage. Do not ignore encroachments for fear of upsetting your neighbor; in the long run, this could cost you part of your property. If you find trespassers living on your property, you can bring an action for ejectment or to quiet title. Fortunately, the burden of proof for ownership falls upon the trespasser – if you have all your documentation and have been paying property taxes, you stand in good stead.